Maxi-Cool™ Junior Coolers are engineered to provide continuous cooling for transmissions with extreme operating temperatures such as vehicles with high stall speed converters, trans brakes or racing transmissions, Maxi-Cool™ Junior Coolers feature Turbulator™ heat sink inserts in 1/2" aluminum tubes with 3/4" aluminum fins. Ideal for Super Comp, Super Gas and bracket cars. 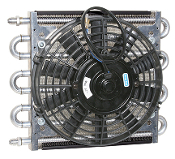 Rugged metal mounting brackets solidly connect the electric fan to the cooler coil. Equipped with -6 AN Male fittings and AN to Hosebarb fittings for your choice of oil hose types: standard or braided steel hose. Supplied with P/N 109 Heavy Duty Mounting System. Plumbing installation systems and electric fan wiring systems sold separately.